In this painting, Artist and His Model, Picasso expressed the complicated connections between the painter and his model. It is painted in grey and while and this painting is the starting point for a long series with the thematic style. 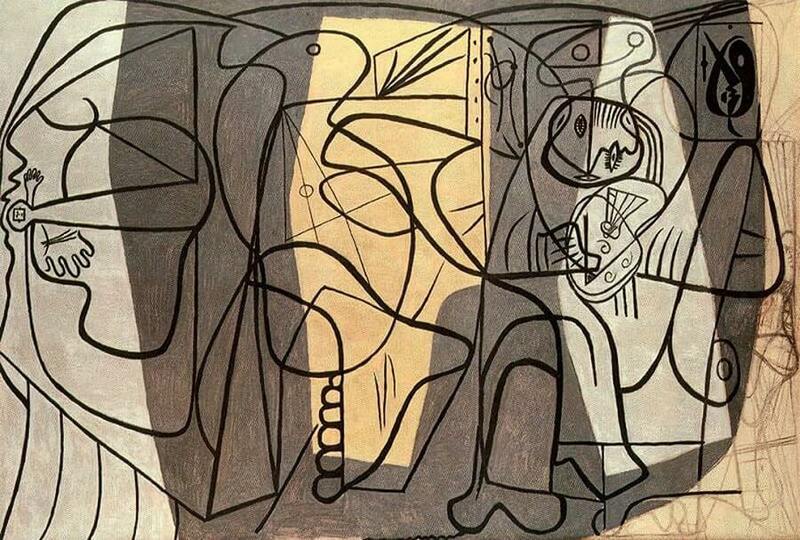 In this style, the figures of the subjects are build upon a network of intertwining curved lines. This painting, together with another one, The Dressmaker's Workshop, is the contemporary style with large monochromatic grey composition. The pattern of rounded forms is symbolic for the style called "Curvilinear Cubism". This painting is a symbolic representation of the act of creation and a major theme in Picasso's work. This painting is part of the series of "Studios" of 1927/28 and in the VollardSuite. The artist is on the right side with his painting palette with his head doubled and figures totally disorganized, especially the eyes. The model is on the left and is simplified to a tiny head with a long neck, and hands of different sizes and a huge foot. In the background the viewers can see the side of the canvas and a small picture showing a lunar head. In this painting Picasso inaugurates his extreme transformations of the female body by altering its proportions through striking inversions of perspective.